G’day, forex mates! If you’re hunting for a potential catalyst for the Aussie, then huddle up since we’ll be getting Australia’s October period jobs report tomorrow (November 17, 12:30 pm GMT). And if you need to get up to speed on what happened last time and what’s expected for the upcoming jobs report, then this Forex Preview will help you out. 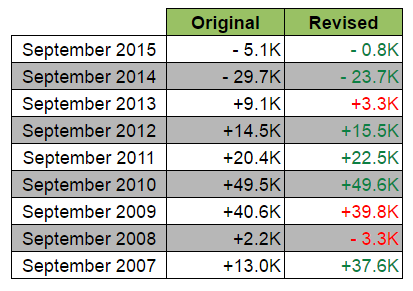 And, well, the actual reading for employment change was a disappointment alright. 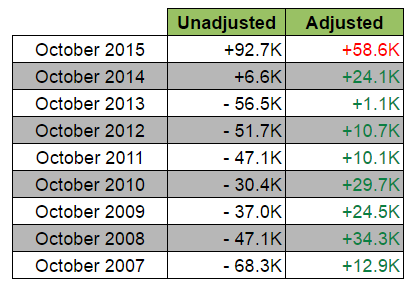 Contrary to what the leading indicators were saying, employment actually fell by 9.8K in September. Moreover, the net loss in employment was due to the stunning loss of 53K full-time jobs, which was partially offset by the increase of 43.2K jobs. The huge loss of full-time jobs is the largest in five-and-a-half years! Not only that, the reading for August was also downgraded from a stinging loss of 3.9K jobs, to a more painful loss of 8.6K jobs. Ouch! And while the jobless rate did tick lower to 5.6% from the previous month’s upwardly revised 5.7% reading, a look at the labor force participation rate quickly reveals that it ain’t all that good. You see, the labor force participation rate dropped from 64.7% to 64.5%, which is a low not seen since November 2014. Moreover, the participation rate has been sliding lower for two consecutive months already. Overall, the September jobs report was pretty bad, which is why forex traders dumped the Aussie as a knee-jerk reaction. Heck, the report was so bad that there was even some follow-through selling after that. For the employment situation in October, the consensus among many economists is that Australia will see a net increase of 20.3K jobs. However, the jobless rate is expected to worsen from 5.6% to 5.7%, due to expectations that the participation rate would also rise from 64.5% to 64.6%. Okay, time to take a look at the leading labor indicators. AIG’s performance of services index (PSI) for October recovered from 48.9 to 50.5. The employment sub-index more than just recovered, since it surged by 8.6 points to 52.9. Next, AIG’s performance of manufacturing index (PMI) also recovered from September’s 49.8 reading, climbing back above the 50.0 stagnation level to 50.9. The employment sub-index didn’t do as well, though, since came in at 47.7. This is a full point higher compared to September’s 46.7, however, so the contraction persisted, albeit at a slower pace. AIG’s performance of construction index (PCI), meanwhile, went against the tide because it slumped hard from 51.4 to 45.9, a seven-month low. Fortunately employment still barely grew, since the employment sub-index came in at 50.2. This is 7.4 points lower compared to September’s reading, though. Overall, the leading labor indicators seem to point to jobs growth in October, or at the very least, an improvement in labor conditions compared to September. The consensus reading therefore seems about right. Looking at historical trends, Australia usually sheds jobs in October, but seasonal adjustments almost always result in a positive reading. In addition, estimates by economist tend to fall short more often than not, so there’s a good chance that we may be getting an upside surprise. Also, September’s reading usually gets upgraded, so watch out for that as well. As usual, keep in kind that better-than-expected readings usually cause a quick Aussie rally as a knee-jerk reaction. Worse-than-expected readings, meanwhile, usually trigger a quick selloff. One such example of the latter is how the Aussie reacted to the previous month’s jobs report. For follow-through buying or selling, digging into the details of the jobs report is recommended, although risk sentiment and commodity prices also tend to weigh in.